The Thin White Line is a largely character-driven Wong and Morgan episode airing in the middle of the first season, which involves our hero consulting with an incarcerated murder to help stop a series on on-going offences. The obvious point of comparison will inevitably be Beyond the Sea, Morgan and Wong’s stellar script from the first season of The X-Files. Much as Beyond the Sea served to define and expand Scully as a character, The Thin White Line is more keenly focused on Frank Black than any other episode this season. However, there are other similarities. Most obviously, both Beyond the Sea and The Thin White Line wear their influences on their sleeves. It is very hard to watch the interactions between Scully and Luther Lee Boggs in Beyond the Sea without conjuring up images of Clarice Starling and Hannibal Lecter from The Silence of the Lambs. It doesn’t matter that Boggs is a completely different animal from Lecter; The Pilot positioned Scully as an analogue for Clarice Starling, so it makes sense that Beyond the Sea will be read in that manner. The Thin White Line does something similar with the character of Frank Black. The work of Thomas Harris seems to have been a significant influence on Chris Carter; both Fox Mulder and Frank Black seem to draw from the character of Will Graham, Harris’ original damaged psychological profiler. This is more obvious with Frank Black, as the character still works as a forensic profiler. However, like Will Graham before him, Frank Black retired from the Federal Bureau of Investigation before working as a consultant. Any episode featuring Frank Black in conversation with a serial killer that he helped to catch will inevitably evoke Red Dragon, or the film Manhunter. Indeed, Wong and Morgan seem to cleverly play into this. If you are going to fashion a lead character around an archetype like that, you may as well use that archetype in a story suited to them. So The Thin White Line plays up its loose structural similarities to Red Dragon. It is a clever move, and one that pays off. This is a story very suited to Frank Black as a character. Like Will Graham, Frank is wounded in the apprehension of this suspect; like Will Graham, Frank is forced to visit this serial killer in custody, where the killer is still a violent menace to those around him. Unlike The Silence of the Lambs or Beyond the Sea, The Thin White Line makes a conscious effort to limit Frank’s interactions with Richard Alan Hance. The two characters share a single scene together at the centre of the story, like Will Graham and Hannibal Lecter share a limited central interaction in Red Dragon. However, while this provides a framework for The Thin White Line, it is not the substance. A lot of Morgan and Wong’s work in this season of television is fascinated by the ideas of cycles and recurrences. Home was a story about the past haunting the present, while Musings of a Cigarette-Smoking Man proposed a dark spectre stalking American history. Literal reincarnation was a major part of The Field Where I Died, while Scully fails to break out of a depressing cycle in Never Again. In an interview with Back to Frank Black, James Wong explained that The Thin White Line was loosely inspired by The Executioner’s Song, Norman Mailer’s account of the execution of Gary Gilmore. Gilmore was the first person to be executed after the Supreme Court reinstated the death penalty in 1976. His last words were a simple “let’s do it” before his firing squad. Gilmore had actively sought the death penalty as punishment for his murders of Max Jensen and Bennie Bushnell. He also attempted suicide twice while in captivity. They got to speaking of karma. Ever since she was a kid, she had believed in reincarnation. It was the only thing that made sense. You had a soul, and after you died, your soul came back to earth as a newborn baby. You had a new life where you suffered for what had done wrong in your last life. She wanted to do it right so she wouldn’t have to make another trip. To her amazement, he agreed. He said he had believed in karma for a long time. Punishment was having to face something you hadn’t been able to face in this life. Yes, he told her, if you murdered somebody, you might have to come back and be the parents of that person in a future century. That was the whole point of living, he said, facing yourself. If you didn’t, the burden got bigger. The Thin White Line is not set on death row, and it does not explicitly engage with the idea of reincarnation. Instead, the episode is more interested in cycles of violence as they occur in the world. Indeed, when Jacob Tyler starts committing murders in the style of the incarcerated serial killer Richard Alan Hance, Frank explicitly describes him as “the living reincarnation of Richard Alan Hance.” Violence begets violence. It perpetuates and continues; blood will have blood. Arcs and circles are a recurring motif in The Thin White Line. Frank Black first stumbles across the case when he recognises a familiar wound pattern on a woman rushed into the hospital; it is a wound pattern that he shares. Hance marks his victims with an arc on the hand – an incomplete circle. Both Hance and Tyler kill in sets of four – two sets of two. In fact, the first time that the authorities identify Tyler, he is already completing his pattern. “That means that the liquor store owner completed the cycle,” Frank reflects. As with a lot of Morgan and Wong scripts at this point in their creative career, The Thin White Line is fixated on partners and mirroring. 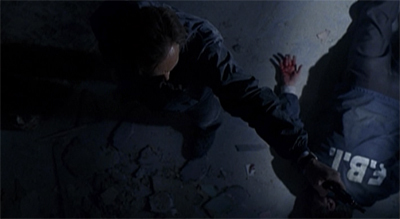 In Never Again, Scully accepts her place as Mulder’s partner; in The Field Where I Died, Mulder meets his true love reincarnated; in Musings of a Cigarette-Smoking Man, the Cigarette-Smoking Man looks on with envy at Bill Mulder and his family; in Dead Letters, Jim Horn is a cautionary tale for Frank Blank. This idea of doubling and unifying plays through The Thin White Line. The killers in The Thin White Line are all about doubling and mirroring. They mark their kills with two halves of the same playing card. Frank suggests that Hance does not love Tyler for who he is, but for the fact that he could fashion Tyler into a younger version of himself. “You killed him and made another Richard Hance.” Tyler seems trapped inside an echo chamber; The Thin White Line provides two versions of his two kills, demonstrating that Tyler has completely disconnected himself from reality in order to commit his crimes. In contrast, The Thin White Line suggests that healthy unities are created by opposites. It is telling that Frank is horrified by the nightmare where two versions of himself murder Richard Hance – there is nothing more terrifying than an echo chamber. Instead, Frank is contrasted with other characters in the narrative. He is alive; Hance’s other victims are deceased. Bob Bletcher is cynical and nihilistic in his attitude towards Jacob Tyler, while the climax suggests that Frank is a little optimistic towards Richard Hance. After all, the episode suggests that Hance is the product of a perpetual cycle of violence. The state gave up on him as a child, with Frank observing, “In county social-welfare parlance, he was labelled irredeemable.” Hance grew up illiterate, and served in the Vietnam War. The Thin White Line makes a number of overt nods towards the conflict. 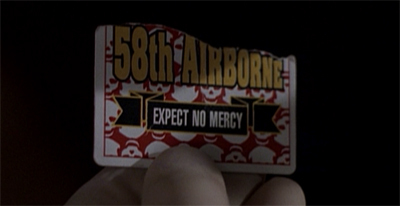 Hance wears war paint while stalking the FBI agents, and marks his kills with death cards. Although he had taken two lives before enlisting, it seems that the army helped to turn him into a more effective and industrious killer. Gary Gilmore is not the only influence on The Thin White Line. As ever, Morgan and Wong have done meticulous research into their subject matter. For example, Jacob Tyler’s visions resemble the legal defence offered by killer Herbert Mullin. In court, Mullin claimed that he heard his victims telepathically agree to be murdered. Of course, there is considerable debate about whether Mullin actually believed that, or whether it was just a cynical and calculated part of a mental illness defence. The interview between Frank Black and Richard Alan Hance is inspired by the third interview between FBI profiler Robert Ressler and serial killer Edmund Kemper. After the first two interviews went well, Ressler met Kemper alone. After their conversation, Ressler attempted to summon a guard using a button like that featured in the episode. When no guard was forthcoming, Kemper observed, “If I went apesh!t in here, you’d be in a lot of trouble, wouldn’t you? I could screw your head off and place it on the table to greet the guard.” Hance makes a similar observation. Although there are efforts made at rehabilitative justice, it seems like a significant portion of prison is dedicated to simple logistics; locking up offenders where they cannot bother the rest of society. This is certainly a valid response to certain types of offenders, but is not a “one size fits all” model of justice. It is not uncommon for people to enter prison clean and leave with a very expensive crack habit. People often leave prison more damaged and more dangerous than when they first went in and we are mistaken if we think we can avoid having that inflicted on us when they come back to our streets. Of course, “bank robber to serial killer” is a fairly dramatic shift, but The Thin White Line is clearly drawing on that same logic. Locking criminals away with other more violent criminals is not a practical or viable long-term solution to the sort of anxieties that trouble Millennium. In many ways, The Thin White Line helps to reinforce the sense that Frank Black is a truly and unquestionably heroic figure. He seems frustrated at the death of Jacob Tyler, despite the murders that the young man committed. “How did we get to this place where the only thing we’re good for is notifying the loved ones?” he ponders. In his nightmare, he is horrified at the thought that he might have made the same decision as Bletcher; that he might have killed Richard Alan Hance if he knew what was coming. After all, the closing scene suggests that there might still be hope. Even after everything that has happened, Frank takes pity on Hance. He arranges for the prison to turn off the fluorescent light bulbs hovering ominously over Hance’s cell. Finally spared the “sixty-cycle hum”, Hance breaks down crying. It is Frank’s empathy that defines him. 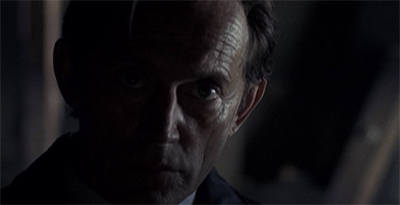 Despite his ominous last name and Lance Henriksen’s serious countenance, Frank Black is a beacon of light in a world that is largely dark. In fact, The Thin White Line is notable for its decision to feature Frank Black holding a gun. This makes a great deal of sense in context; after all, Frank is an FBI agent investigating a location that may house a serial killer. It makes sense that he should be armed, and should use his firearm to capture Richard Alan Hance. Perhaps more controversially, Frank has nightmares about using the firearm to kill Hance, but those are mere images designed to convey Frank’s deepest fears and anxieties. 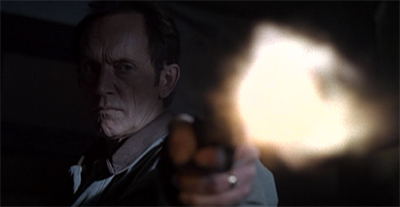 Lance Henriksen remained opposed to the idea of Frank using entirety of the run. Indeed, as part of a press release in 2011 to draw attention to the Back to Frank Black movement, Henriksen argued that Frank Black would be a nice change of pace from more modern television heroes who “fight back with a gun rather than with the mind.” However, despite Henriksen’s misgivings, Frank Black would become a lot more comfortable with firearms during the second and third seasons of the show. In a slightly less overt way than Force Majeure, The Thin White Line harks forwards towards the second season. In keeping with Morgan and Wong’s other scripts for the first season, there is an emphasis on perception. Like Loin Like a Hunting Flame before it, The Thin White Line invites the viewer into the head of the serial killer. However, The Thin White Line is a lot less “flashy” about its “killer vision.” The episode is less eager to delineate between subjective visions and objective reality. The hero’s remarkable inner eye is dilated as his trademark visions are supplemented with recurring nightmares, dreams in which he is forced to relive one of the most terrifying confrontations of his life. One of these dream sequences in particular, in which the present day Frank joins forces with his wide-eyed younger self in an effort to re-write history, beautifully enacts the struggle of the story. Morgan and Wong remain true to form with the script, forever aiming to more deeply explore Frank’s unique way of seeing the world and to ensure that his visions contributed to the themes of the story rather than providing highly stylised distraction or plot loopholes. Dreams are undeniably key to understanding the series and the struggles of its characters and, under the direction of Morgan and Wong, dreams and visions would become an increasingly intrinsic element of Millennium’s deepening mythology. While The Thin White Line does feature a few of the trademark quick-flash visions associated with the show, it seems much more interested in dreams and perceptions. The Thin White Line does not consciously hark towards the second season. After all, Morgan and Wong were departing Ten Thirteen to work on their own pilot, The Notorious. Fox had agreed to produce the pilot in return for their assistance with The X-Files and Millennium in the first half of the year. 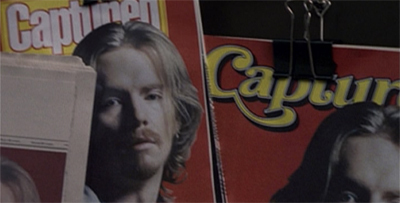 The two writers would not be recruited to run the second season Millennium until Fox decided not to pick up The Notorious. When it was broadcast, it was quite likely that this would be the last episode of The X-Files or Millennium credited to the pair. While still somewhat jaded and world weary, The Thin White Line feels like a decidedly more optimistic and upbeat end point for James Wong and Glen Morgan than Never Again. Appropriately enough, it ends with the lights going down. However, The Thin White Line positions this as a sign of hope and reconciliation rather than anything more cynical. There are worse notes upon which to end. Two things here caught me off guard when watching this one again. Morgan & Wong very rarely adopted Carter’s version of evil but that’s essentially what happens here with Hance “infecting” Tyler. Frank wants to cure Tyler but doesn’t get the chance. It also lays some foundation for where Morgan & Wong pick up in their next script on the series, Beginning and the End by showing that Frank has or is already contemplating killing one of the murderers he is chasing. That’s a very good point about the vision of evil as glimpsed in that episode, with Morgan and Wong accepting a very Carter-esque vision of evil as infectious. But I think you’re also right that there is something very Morgan and Wong in the script’s willingness to open Frank up to that evil, suggesting that he is not entirely divorced from it and that evil is not something as alien as the show occasionally suggested.